The SQL Server 2012 Performance Dashboard Reports are Reporting Services report files designed to be used with the Custom Reports feature of SQL Server Management Studio. The reports allow a database administrator to quickly identify whether there is a current bottleneck on their system, and if a bottleneck is present, capture additional diagnostic data that may be necessary to resolve the problem. This is a downloadable available from Microsoft and can be downloaded from the link here. "Cannot connect to WMI provider. You do not have permission or the server is unreachable. Note that you can only manage SQL Server 2005 and later servers with SQL Server Configuration Manager. Invalid class [0x80041010]"
During the setup sometimes, some .mof files don't get installed and registered properly and this causes the above error to pop up. Go to the path "C:\Program Files (x86)\Microsoft SQL Server\100\Shared\" using command prompt. And run the following command mofcomp.exe "C:\Program Files (x86)\Microsoft SQL Server\100\Shared\sqlmgmproviderxpsp2up.mof"
Once the commands execute successfully, you will be able to open the SQL Server configuration Manager. We all know that Denali was launched with many new things built within. In those wide range of new enhancements, a separate tab for Startup parameters is one among them. 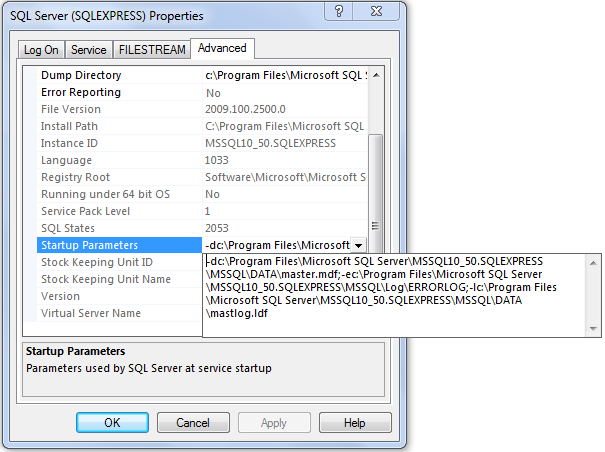 Go to Denali's "SQL Server Configuration Manager"
Right-Click on a SQL Server Service and Choose "Properties"
Now, in the properties page you can find a new tab for "Startup Parameters"
The Older versions of SQL Server Configuration Manager used to show the "Startup Parameters" as part of "Advanced" Tab.